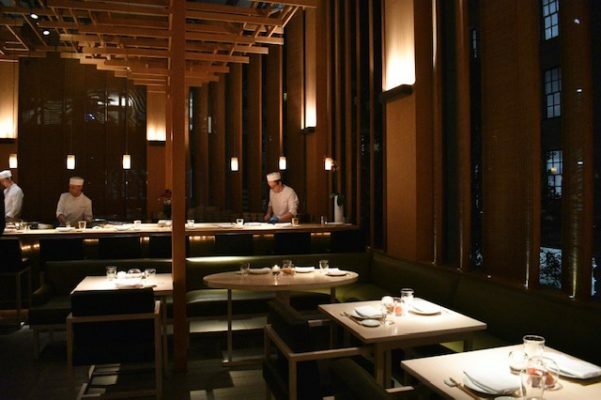 The renowned Sake no Hana restaurant in Mayfair serves up modern authentic Japanese dining. 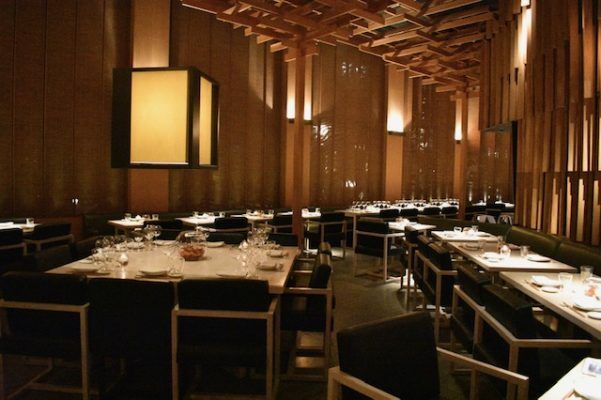 It oozes style and sophistication with interiors designed by Japanese architect Kengo Kuma. 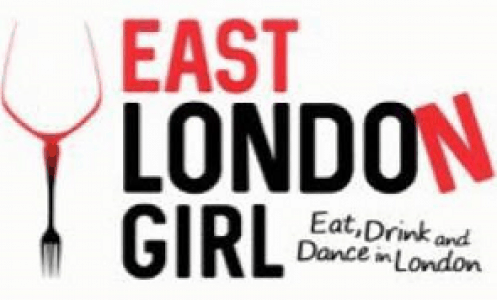 This is matched by great customer service and some really impressive food and drinks. 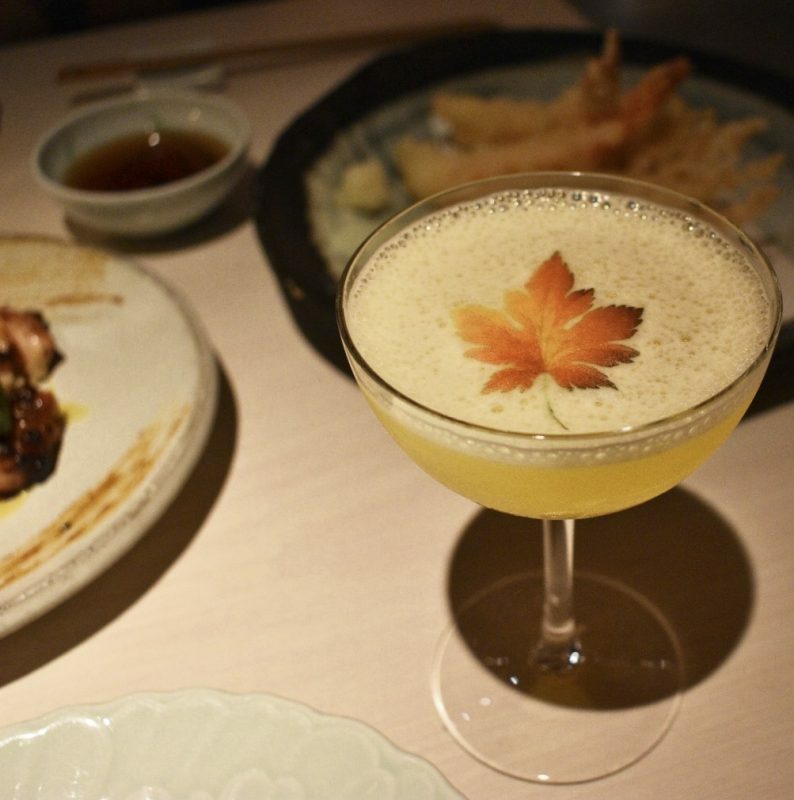 In their words, Sake no Hana celebrates ‘Autumn Leaves’ throughout October and November. For thousands of years people in Japan have taken part in momiji-gari, the act of viewing Japanese maple trees in their fiery shades of reds, oranges and golds. 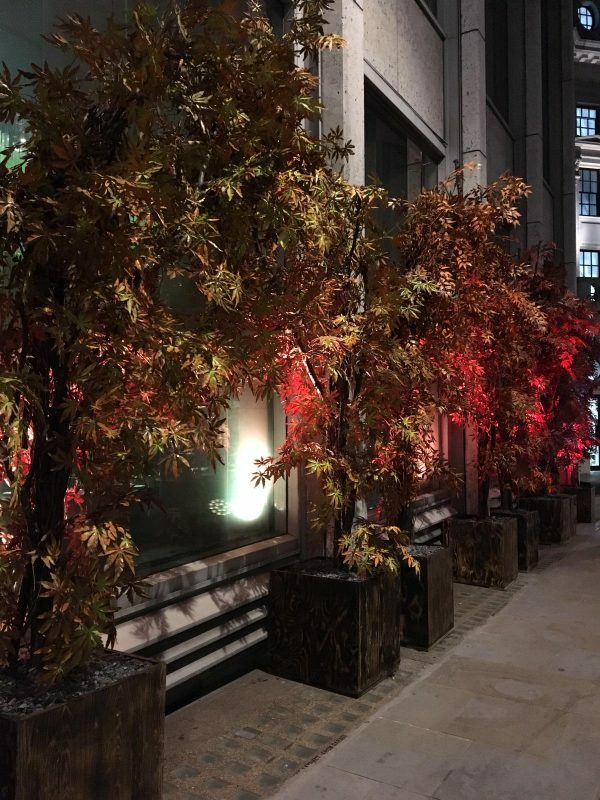 Paying homage to this ancient custom, Sake no Hana has created an installation of autumn leaves outside the restaurant. This is accompanied by an exclusive menu created by Executive Chef Hideki Hiwatashi and a special cocktail flight created in partnership with Belvedere vodka and Ruinart Champagne. This menu is priced at £40 per person and £23 for the cocktail flight to share between two. First up was a delicious and warming Kinoko Misojitate: wild mushroom and chilli yuzu miso soup. This was the perfect start to our feast! For the first course we had Maguro Tartar: tuna tartare with egg yolk sauce, Crispy Truffle Rice: fried truffle rice with seasonal mushrooms, Shiitake Tofu: shiitake mushrooms filled with homemade tofu and wasabi sauce and Autumnal Crisps: sweet potato and beetroot crisps with soba noodles. The tuna tartare was deliciously fresh and zesty and the tofu stuffed mushrooms were full of flavour and had great heat from the wasabi. We particularly loved the crispy rice balls which were crunchy, sticky and just so tasty. This was accompanied by the Shiso 54 cocktail with Belvedere vodka, Midori, lime, shiso, Fever-Tree slim line tonic and Prosecco. The cocktail had really subtle flavours and was served in cute little glasses. For the main course we chose Tori Sumiyaki: chargrilled miso chicken with sesame chilli miso and Kisetsu Tempura Moriawase : prawn and seasonal vegetable tempura. Our cocktail of choice was the Koyo Nora. This had Belvedere vodka, cardamom, mandarin, yuzu and edible rice paper art. 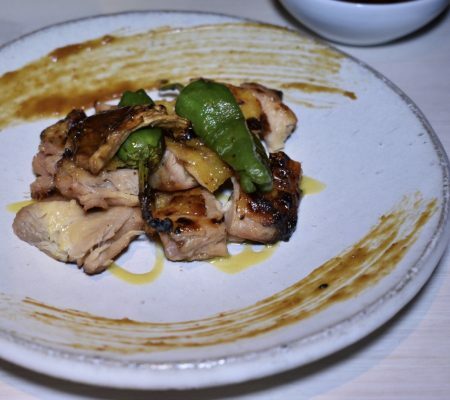 The miso chicken was juicy and cooked perfectly with just the right amount of miso coming through. The tempura was amazing and perfectly fried to ensure crispy skin and soft veggies on the inside. Our cocktail looked gorgeous and packed a punch! It was full of citrus flavours which complimented our meals well. 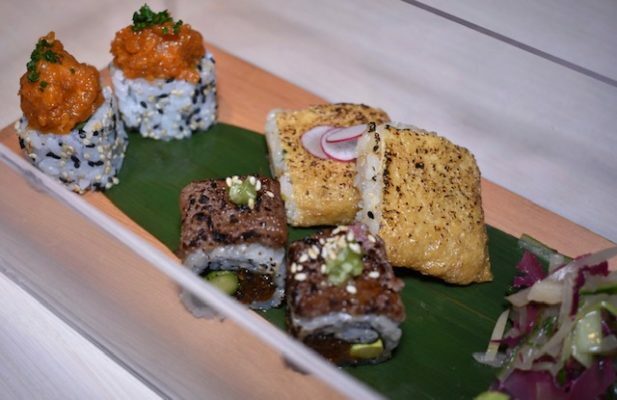 We loved the inari with the gorgeous sweet fried tofu and the spicy tuna had a great flavour. However, the star of the show was the melt in the mouth wagyu beef maki. 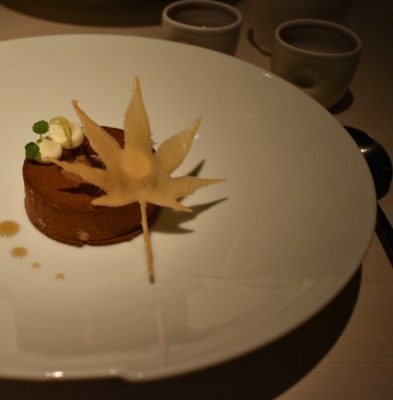 For the final course we had the beautiful Autumn Leaf desert. This was hazelnut feuilletine and hazelnut chocolate parfait with chocolate and maple syrup soup and a mascarpone mousse. 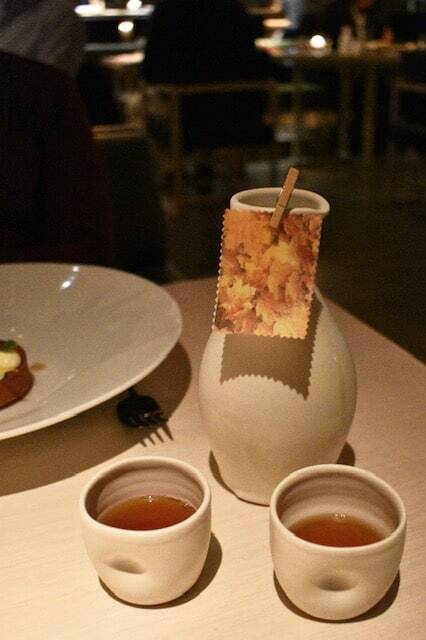 Served with this was a Hot Maple Toddy:Hennessy Fine de Cognac, Akashi-Tai umeshu, ginger, maple, chocolate and edible rice paper. This was one of those deserts where no matter how full you were you’d be able to eat it! It was so delicious, with velvety soft parfait and crunchy hazelnut being enveloped by the maple soup. The hot toddy was a great addition too and so nice to end on a warming note. 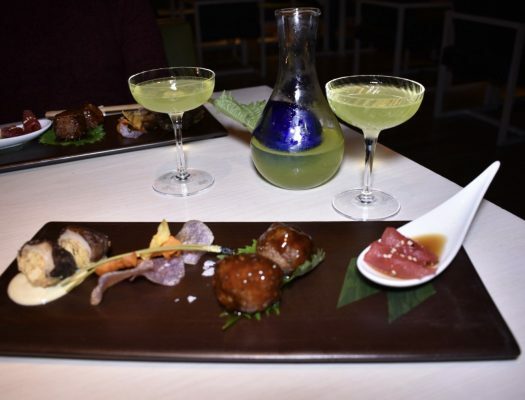 We had a great experience at Sake No Hana with amazing service the whole evening. The food was all so incredible and the cocktails were great value and delicious. It really was a wonderful Japanese fine dining experience at this gorgeous restaurant in Mayfair.